A view of the Thera caldera from the Greek island of Santorini. (CN) – New research into ancient tree rings from half a world away could settle lingering questions about when the Greek volcano Thera erupted and resolve long-standing questions about Mediterranean archaeology, scientists say in a study released Wednesday. 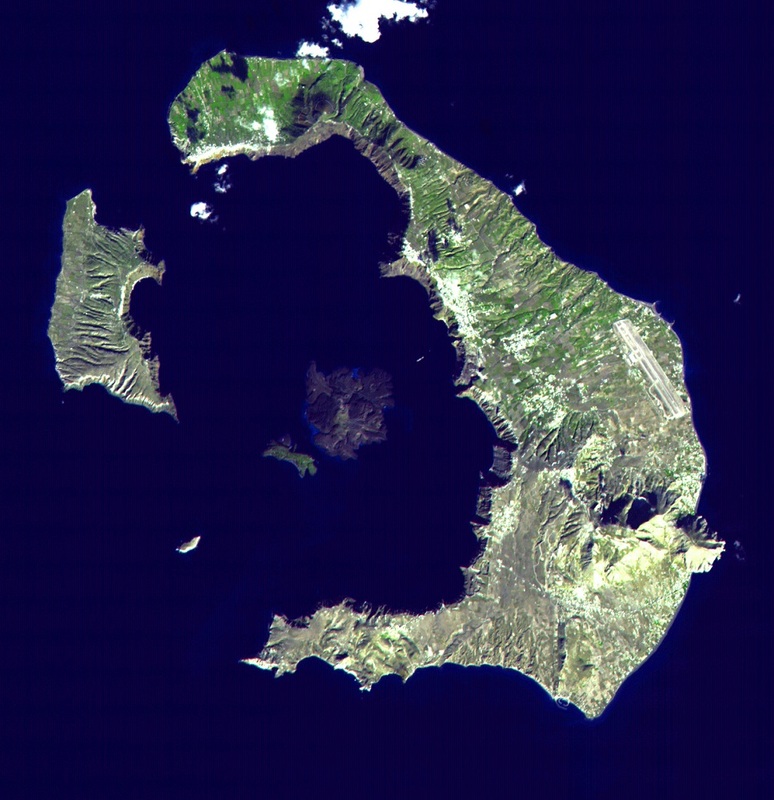 The Greek island of Thera, now known as Santorini, was the site of one of the largest volcanic eruptions in history. Scientists believe the volcano erupted in the 16th century B.C., about 3,400 years ago, blowing some 24 cubic miles of rock and ash into the atmosphere. While there are no clear records about the eruption, it had long-lasting and wide-ranging effects on the Mediterranean region – and destroyed the Minoan civilization. The eruption likely inspired several Greek myths. Some have linked the event to the parting of the Red Sea in the biblical story of Exodus, while others believe it tied to the fabled lost city of Atlantis. Pinpointing the exact date of the eruption, however, has eluded scientists for years. In an attempt to resolve discrepancies between the methods used to date the eruption, scientists from the University of Arizona looked to the trees of the era. “There’s been a huge debate about the timing of the Thera eruption and radiocarbon versus archaeological dating,” said lead author Charlotte Pearson, a professor of dendrochronology at the university’s Laboratory of Tree-Ring Research. Massive volcanos like Thera actually cool the earth with the material ejected into the atmosphere. The researchers were able to determine colder years in the tree rings of Irish oaks and bristlecone pines in California. Both species have extremely long lives, with the oldest living bristlecone pine dating back 5,000 years. The findings, published in the journal Science Advances, were based on analysis of 285 samples of tree rings using more current techniques than before. Previously, scientists had to use chunks of wood for radiocarbon testing, but new technology allows them to use only slivers. “This research is about Thera, but really, the implications of it are profound for anyone that uses radiocarbon dating throughout the world for this time span,” said co-author Gregory Hodgins. The scientists believe that the eruption happened between 1600 and 1525 B.C., which overlaps with the date range established through archaeological evidence. “It’s about tying together a timeline of ancient Egypt, Greece, Turkey and the rest of the Mediterranean at this critical point in the ancient world – that’s what dating Thera can do,” Pearson said.